Last month, Titan Books published Downloaded: Inside the Universe of BSG, David Bassom’s new official companion covering the first two seasons and including a short interview with Luciana. Like Bassom’s regular companions to BSG, Downloaded is an entertaining and insightful read, mixing episode guides, behind-the-scenes anecdotes, glossy photos, and countless interviews. In fact, Bassom’s latest book is actually a full-color and larger version of his first two Official Companions. However, about one third of the original commentary and interviews were cut from the manuscript. Most of Luciana’s comments in the “Scar” chapter are still there, but the separate interview originally included in the Season 2 companion is gone entirely (see transcripts of the original paragraphs). Bottom line: If you don’t own any of the first two companions and/or prefer a full-color book, you might want to pick up Downloaded: Inside the Universe of BSG. But if you’re mostly interested in Luciana’s comments on season 2, you should buy the old Official Companion: Season 2 instead. 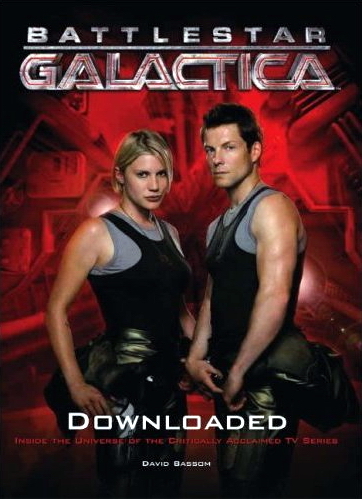 This entry was posted in Uncategorized and tagged Articles + Interviews, Battlestar Galactica, Book, Interview, Merchandise, Official Companion. Bookmark the permalink.